At Lone Survivor Foundation, we love the veteran community. The men and women who serve in today’s all-volunteer military become some of our nation’s greatest assets, exceeding the national norms in education, intelligence, health, and character qualities. However, combat may leave some of these individuals with invisible wounds that need to be addressed. We understand trauma. We know what therapeutic modalities work and why. It is our mission to guide veterans who are living with invisible wounds towards a path of healing that will work for them and their families. Lone Survivor Foundation relies solely on the generosity of our supporters in order to provide our therapeutic retreats to wounded service members and their families, and we need your help. We’d like to introduce you to the backbone of our foundation: the Ground Support Crew, a group of committed supporters who sustain us by giving on a monthly basis. Express your gratitude: join now! We offer our services to veterans and their families at no cost. We also cover the cost of any transportation needed to get them to our retreat facility. We want our services to be available to everybody who needs us, and predictable contributions from monthly donors make that possible. In 2011, we held just four retreats. In 2017, we conducted 38 retreats. In order to sustain our exponential growth and serve more veterans, we need to increase our base of dedicated supporters. Each month, we share some of the powerful, healing moments that we have the privilege of witnessing at our therapeutic retreats in a special email to our Ground Support Crew called the Monthly Bravo Zulu. 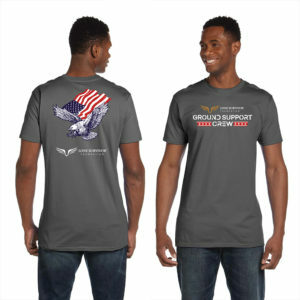 Special Thank You Gift: Anyone who joins the Ground Support Crew by Sunday, August 12th will get a limited edition t-shirt to help them spread awareness about LSF. This exclusive design was created for our monthly donors and will not be sold in our store. Once your signup is received, you will be contacted for your size. You should receive your shirt around late September. Join now to reserve yours! 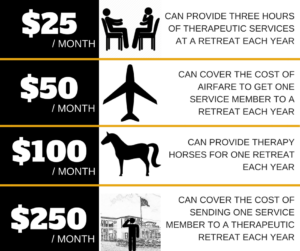 WHAT CAN YOU PROVIDE FOR VETERANS FOR AS LITTLE AS $25 A MONTH?